I met Phyllis and Julie in September of 1961. I had just graduated from the University of Chicago where I had joined the YPSL, and was passing through New York on my way to London. I met them at Julie’s machine shop in Great Jones Street in the East Village and they took me out for lunch at the corner diner on Lafayette and Great Jones. There they told me that the first issue of New Politics had just come out, and as the good and experienced organizers they were, they immediately enrolled me as their London distributor. For the two years I lived in that city I duly and enthusiastically distributed a sizable bundle every quarter — with the help of a British comrade who had a car — to some eight or ten major bookstores in the metropolitan area. As a young student who had just begun to get a political education, I read practically every single article and book review that New Politics published in the sixties, and continued to do so as I became a politically mature person in later decades. 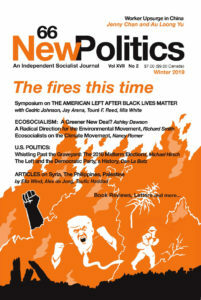 For its first few years, New Politics published an article by Hal Draper in each of its issues; these articles along with "The Two Souls of Socialism," also published in the journal, became the foundation stone of my Socialism from Below politics. It was New Politics that introduced me to American labor. The articles by the labor attorney Burton Hall on the legal aspects of union democracy, Herbert Hill on racism in the unions, and Stan Weir and Steve Zeluck on the fight for union democracy in the ILWU and AFT became the main foundations of my understanding of American labor at a time when the postwar boom was coming to an end. It was also through New Politics that I began to acquire an understanding of the nature of the Soviet bloc, and became exposed to the critical issues facing the black and women’s movement. From the beginning it was evident that Phyllis played a central and indispensable role in the journal both as an excellent editor with a sharp eye for academic and sectarian nonsense, throat clearing and other writing vices, and as a contributor on her own right. Like Julie, she was a child of the now extinct Jewish blue-collar working class — Phyllis’ father was a waiter at Ratner’s for many years, and like Julie, she was among the rapidly diminishing number of self-taught public intellectuals who never held an academic position whether as a professor or as a professional researcher. I am convinced that many of Phyllis’ strengths as a writer and as an editor were rooted in her having been untouched by the academic world. In 1983, Selma and I moved to Brooklyn a couple of blocks from the Jacobson’s magnificent brownstone on Clinton Street. This introduced a whole new element into my relationship with them. I got to know them as people and as neighbors. Shortly after we moved into the neighborhood, Bell and Howell, the corporation that had bought Julie’s machine shop and retained him as a manager, shut down the business “deindustrializing” Julie and his workers (who had become unionized after Julie brought the UAW into the shop). He and Phyllis, who had also stopped working full time for pay as an editorial assistant, began to alternate between spending several months editing New Politics and spending the rest of the year in southern Europe. Phyllis helped to pay their way there by working as a part-time travel agent (we were among her clients). As friends and neighbors, Phyllis and Julie would give us advice about wine and restaurants, house painters and contractors, and gave us shelter when our boiler shut down in the middle of a terrible snow storm. We in turn tried to be as helpful neighbors as possible and kept an eye on their house, which to us was like a museum, and their garden while they were away in Europe. They had only a flimsy lock on their entrance door and we worried that during our watch the house would be burglarized and all their collected treasures would vanish from one day to the other. As we were in the process of selling our house to move to Manhattan, we were surprised and amused by Phyllis’ frantic reaction to the news that a political person she particularly disliked had come to see our house as a potential buyer. Fortunately for her, there was no second visit, much less any purchase offers. Years later, when we used to visit Phyllis in the nursing home, I would go over that and other stories and always got her reaction: a smile and a raised finger like she used to do in a previous time when making one of her incisive comments. That’s how I knew she and I were connecting. Goodbye Phyllis. It has been a real privilege to be your comrade, friend, neighbor. SAMUEL FARBER was born and raised in Cuba. He is a long-time socialist and the author of numerous works on Cuba including Cuba Since the Revolution of 1959: A Critical Assessment (Haymarket Books, 2011).